An induction furnace is an electrical furnace in which the heat is applied by induction heating of metal. Induction furnace capacities range from less than one kilogram to one hundred tonnes capacity and are used to melt iron and steel, copper, aluminium and precious metals. Since no arc or combustion is used, the temperature of the material is no higher than required to melt it; this can prevent loss of valuable alloying elements. The one major drawback to induction furnace usage in a foundry is the lack of refining capacity; charge materials must be clean of oxidation products and of a known composition and some alloying elements may be lost due to oxidation (and must be re-added to the melt). 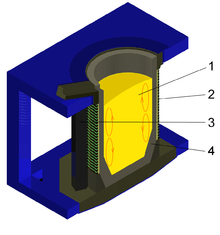 In the coreless type, metal is placed in a crucible surrounded by a water-cooled alternating current solenoid coil. A channel-type induction furnace has a loop of molten metal, which forms a single-turn secondary winding through an iron core. An induction furnace consists of a nonconductive crucible holding the charge of metal to be melted, surrounded by a coil of copper wire. A powerful alternating current flows through the wire. The coil creates a rapidly reversing magnetic field that penetrates the metal. The magnetic field induces eddy currents, circular electric currents, inside the metal, by electromagnetic induction. The eddy currents, flowing through the electrical resistance of the bulk metal, heat it by Joule heating. In ferromagnetic materials like iron, the material may also be heated by magnetic hysteresis, the reversal of the molecular magnetic dipoles in the metal. Once melted, the eddy currents cause vigorous stirring of the melt, assuring good mixing. An advantage of induction heating is that the heat is generated within the furnace's charge itself rather than applied by a burning fuel or other external heat source, which can be important in applications where contamination is an issue. Operating frequencies range from utility frequency (50 or 60 Hz) to 400 kHz or higher, usually depending on the material being melted, the capacity (volume) of the furnace and the melting speed required. Generally, the smaller the volume of the melts, the higher the frequency of the furnace used; this is due to the skin depth which is a measure of the distance an alternating current can penetrate beneath the surface of a conductor. For the same conductivity, the higher frequencies have a shallow skin depth—that is less penetration into the melt. Lower frequencies can generate stirring or turbulence in the metal. A preheated, one-tonne furnace melting iron can melt cold charge to tapping readiness within an hour. Power supplies range from 10 kW to 42 MW, with melt sizes of 20 kg to 65 tonnes of metal respectively. An operating induction furnace usually emits a hum or whine (due to fluctuating magnetic forces and magnetostriction), the pitch of which can be used by operators to identify whether the furnace is operating correctly or at what power level. ↑ Laughton, M. A.; Warne, D.F. (2002). Electrical Engineer's Reference Book, 16th Ed. Newnes. pp. 17–19. ISBN 0080523544. ↑ Campbell, Flake C. (2013). Metals Fabrication: Understanding the Basics. ASM International. pp. 63–65. ISBN 162708018X. ↑ Bauccio, Michael (1993). ASM Metals Reference Book, 3rd Ed. American Society for Metals. p. 50. ISBN 0871704781. ↑ Robiette, A G (1935). "V: Coreless Induction Furnaces". Electric Melting Practice. Charles Griffin & Co. pp. 153–252. ↑ Induction and Dielectric Heating. Electricity and Productivity Series, Nº6. British Electrical Development Association. 1962. pp. 8–9. ↑ Bhattacharya, S.K. (2009). Fundamentals Of Power Electronics. Vikas Publishing House Pvt. pp. 142–143. ISBN 8125918531. Foseco Ferrous Foundryman's Handbook, Elsevier, 2000.